A crew of miners embark on a journey through the depths of a cave linked to a volcano. An eager adventuer jots down a log entry on the start of his journey on a 3 Dimensional-Palm-Piolet. ..."Chap. 1"he writes..."I'm going to find some valuable artifacts and maybe research the Biju of Light today..." The other men surrounding him are amped and excited weilding drills,various explosives, pickaxes, and small linear lasers for excavating the place. sparkled faintly causing some men to harvest the small fortune. They'd make plans to trade and design equipment for others to purchase. Others trudged on ahead into an section where lava bubbled and splashed near them giving some miners a jolt of fear as they pressed on going deeper into the place. Re: Discovering Meian, Wrath of the Bijuu!! Without hesistation one of the miners tosses a packet of C4 onto the wall as the rest get away from it. BOOM! !...Dust and debris obstruct their vision for a few moment as the men point their lasers at the smog. "Everything's clear"...with caution they enter the room with their eyes widen by what they've found. Meian eyes are shut closed behind frost covered glass that appear to them as an enormous emerald. "Whoa" they exclaim in excitement. Each of them go over to dust the machine off and examine its texture. Much to their dismay they find a special seal tag that kept it running. "What a waste of time this was!!" one of them grunts..."Hold on a second theirs someone inside of this thing.He may have knowledge of the past,perhaps he's a caveman or boy by the looks of it. Remove the seal!! The seal is removed as the chamber powers down.Without warning, the head hung low behind the glass slowly lifts,until eye level with one who ordered the seal to be removed. The lids of Meian's eyes peeled open with Sharingan first tomoe spinning in each eye causing the man to jump back in fright. "Demon child!! "...He screams as Meian shoves on the glass with both palms forcing it to open. The 12yr old drops to the floor coughing as the cold air of the liquid nitrogen prison rises to the ceiling. Every blood cell in his body starts to slowly heat up as the man barrages the boy in a state of panic with questions such as "Who are you, where are you from, what is your name and how old are you?" Meian could hardly breath, reply, think or react quickly enough to any of these interrogations. He could only cough and gasp for air, and attempt to rise to his feet. Every jutsu except the immediate Taijutsu was momentarily forgotten.The reason for being frozen purpousless since Kabuto was probably long gone. The voices unfamilar, the area blurry. Nothing was clear to him, not his sight, lungs, or mind. He'd soon regain his composure and begin communicating with the miners and answer them. I- I am... ~A short memory reminds him of who he is as he stands there with his right palm on his forehead recouperating from a migrane~ Uchiha Meian of Konoha. I believe I've told you my name already. I, I uhm 12. 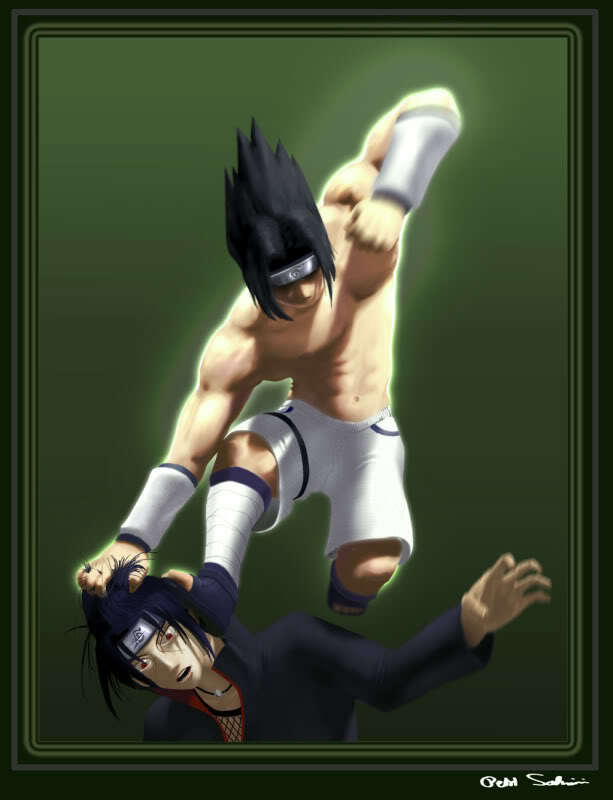 Thanks for getting me out of that thing.Now if you can help me find my uncle Sasuke Uchiha or if possible someone by the name of Madara? All the men in the room blink cluelessly at the names given and Konoha, until one man provides the a horrifying answer.Konoha was obliverated 500 years ago after a catastrophic war caused by Madara Uchiha and some other unrecognizable figures. All of the previous villages changed their names to something else after everything was destroyed.That's about everything I can tell you I'm afraid.He fixes his glasses and shakes Meian's right hand. Welcome to the Future, the Land of Fire and the Village hidden in Magma or that's atleast what I'd call this place. "It hasn't gotten a name yet?" Meian askes the man as they exit small room.No its no longer Hidden in the Leaves ,because of the recent active volcanos burning away most of the forest that once was here.